Florence is a city of art or a work of art? The historical center of Florence contains such a wealth of masterpieces that is difficult to separate the city from his works. There is, however, must stop at the Old Town to appreciate the artistic richness of Florence, the city “outside the walls” and his province for the surprising abundance of precious marks over the centuries by the Medici, the wealthy merchant families, sacred art. We should add that only in the Museums of Florence (the set of twenty museums, the Uffizi to the smaller and unknown) is kept the largest Italian heritage and one of the world. 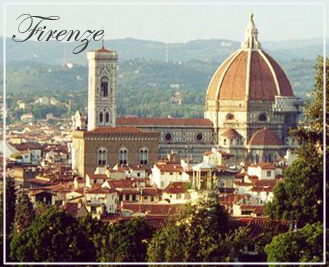 Follow the routes of the Four Quarters historic Florentine artistic wonders and surprises await you. In the district of Santa Maria Novella, begins with the visit of the homonymous Church and the adjoining museum where you can admire masterpieces by Ghirlandaio MAsaccioe. Continue the visit to the Museo Marino Marini, completely dedicated to the sculptor and the Strozzi Palace, now home to incredible art exhibitions. Visit the Church of Holy Trinity and the jewel of the Last Supper by Ghirlandaio in the Church of All Saints. In the District of St. John, stands the magnificent masterpiece of the Cathedral of Santa Maria del Fiore, the titanic dome and Giotto’s bell tower near. To visit Michelangelo’s David, a masterpiece of Renaissance sculpture, it is worthwhile to visit the Accademia Gallery. In the district of Santa Croce Basilica stands the same name that collects straodianri paintings, including works of the master Giotto. Passing through Piazza della Signoria, one of the most beautiful of cities, stands proud Palazzo Vecchio and the world’s most famous art gallery, or the Uffizi Gallery. Finally the Holy Spirit in the District are waiting in their rooms and the magnificent collections of Palazzo Pitti, the Boboli Gardens and the Enchanted Piazzale Michelangelo with the most impressive panoramic view of the city.